Private Secretary launched a last-to-first sprint to reverse a frustrating run of placings in the Magic Millions Fillies & Mares (1300m) at the Gold Coast on Saturday. The Husson mare was runner-up to I Am Zelady in the 2016 Fillies & Mares and followed that with minor cheques in the G3 Wenona Girl at Randwick, G3 Proud Miss at Morphettville, G3 Begonia Belle at Flemington and LR Colin McAlpine Memorial at Eagle Farm. “It certainly was a heart-stopper,” a relieved trainer Greg Hickman said after his mare reversed last year’s result with a head victory over I Am Zelady. “She’s travelled here, there and everywhere so we’re just happy that she’s finally won. The overdue result gave Vinery sire Husson a third rich reward on the Gold Coast following last year’s Magic Millions Cup (Lucky Hussler) and Magic Millions Sprint (Husson Eagle). Lucky Hussler was beaten no more than a length when attempting back-to-back victories in Saturday’s Magic Millions Cup but he didn’t get a crack at the leaders until the race was all over. Private Secretary (7m Husson – Secretaire by Danehill) was bred and sold by Gerry Harvey’s Baramul Stud for $32,000 at the 2011 Magic Millions National Yearling Sale. She has won 8 times in 21 starts for earnings over $1.04 million. Her dam Secretaire won at Flemington and was Group 3 placed in the South Australian Sires’ Produce Stakes. 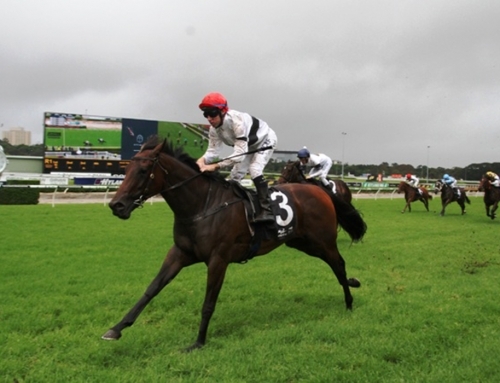 Hickman will set Private Secretary for the Group 1 Coolmore Classic (1500m) at Rosehill on March 11.